Simon Achuba from Ibaji LGA of Kogi East has been sworn in as the Deputy Governor of Kogi state after being screened and confirmed by the Kogi State House of Assembly. 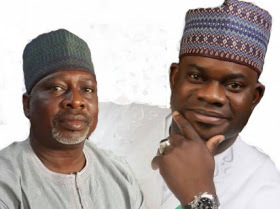 Achuba’s confirmation followed Governor Bello’s letter to the Assembly seeking the confirmation of Achuba as his deputy. According to reports, journalists weren't allowed in to the venue of the swearing in because according to the armed security guards, the Governor said it wasn't a public function.